Bruno Hortelano was a part of a second photo finish during these Olympic Games. 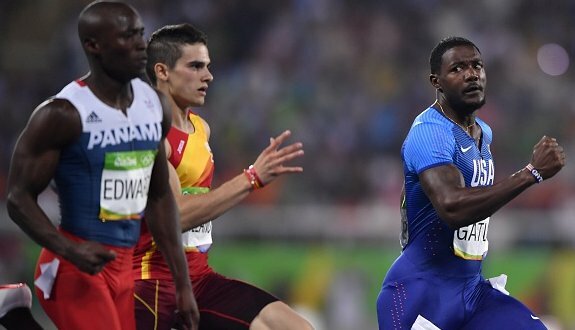 In his 200m semifinal heat, Hortelano was a part of a pack of four with USA’s Justin Gatlin, the Netherlands’ Churandy Martina, and Panama’s Alonso Edwards that crossed the finish in a close pack. Only the top 2 were guaranteed a spot in the finals. After a few minutes, it was announced that Edwards (20.07) and Martina (20.10) got the automatic berths, while Gatlin (20.13) and Hortelano (20.16) will miss the cut as 20.09 was the final non-auto time that advanced. Hortelano finished 10th overall in the event. His preliminary round time of 20.12 is a new personal best for the Cornell alum and also stands as a new Spanish national record and the best ever time for a former Heps athlete. Sean Furey will also not advance to his event final. Furey threw a best distance of 72.61 meters in the javelin throw preliminary round that had him finish 35th overall in the field and last in his group. The top 12 athletes advanced to the finals. This entry was posted on Wednesday, August 17th, 2016 at 8:59 pm. It is filed under Olympics, Spotlight. You can follow any responses to this entry through the RSS 2.0 feed.